Selected Works of Emily J. Houghton, Ph.D.
Our discussion will also include specific events that our students have completed as well as how the clubs provide students with opportunities to develop the skills and abilities to succeed in the sport industry. Christy, K., Zonder, E., Houghton, E. J. & Riemer, B. (2019). Sport management clubs and their relationship to student success. 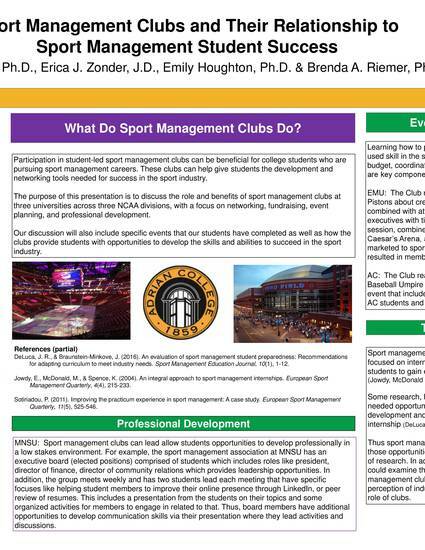 Poster presented at the Applied Sport Management Association Conference. Nashville, TN. Contact Emily J. Houghton, Ph.D.